In Memory of brave family and friends. 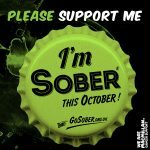 During October we are giving up all alcohol and inviting people to sponsor us and support Macmillan Cancer Support. To show our commitment, we have decided to add £2.00 to the sponsorship fund for every calendar bought online during Sober October. It will be great to help make a real difference to somebody at a most difficult time. If you would also like to make a donation please click on the link below.